The Canadian Embassy in France invites you to a lecture entitled “Savoir-faire, Savoirs verts, Changements climatiques et autochtones dans le Nord du Canada (“Know-How, Green Knowledge, Climate Change and Aboriginal People in Canada’s North”)” by Jocelyn Joe-Strack, Daqualama, Consultant Sub-Arctic Research and Strategy, PhD Candidate, University of Saskatchewan. How can an indigenous nation take control of its future and progress within a country, while empowering social and cultural wisdom? 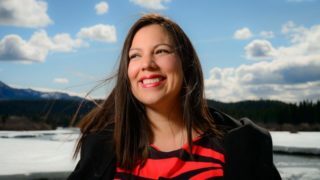 Brilliant scientist, philosopher and business leader Jocelyn Joe-Strack believes that global solutions to challenges such as climate change can be advanced through Indigenous understandings of living well. She applies her experience as a microbiologist, hydrologist and policy analyst to reconcile ancestral knowledge with today’s knowledge. Raised in the Yukon at the heart of Aboriginal culture, a member of the Wolf Clan of Champagne and Aishihik Native American Communities.. Her passion leads her to find progressive approaches for the challenges faced by her community, country and our shared world.